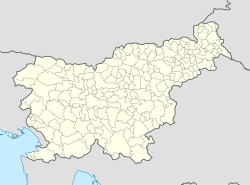 Motnik (pronounced [mɔˈtniːk]; German: Möttnig) is a village in the Tuhinj Valley in the Municipality of Kamnik in the Upper Carniola region of Slovenia. The parish church in Motnik is dedicated to Saint George and is a Baroque building with 19th-century furnishings. Close by is a smaller church, the chapel of Mary Magdalene. Close to the settlement is also an abandoned brown coal mine in which the fossilized remains of a pygmy rhinoceros were discovered in 1910. They were found to be 25 million years old and are now displayed in a small museum in the village. Wikimedia Commons has media related to Motnik. This page was last edited on 22 June 2017, at 04:16 (UTC).